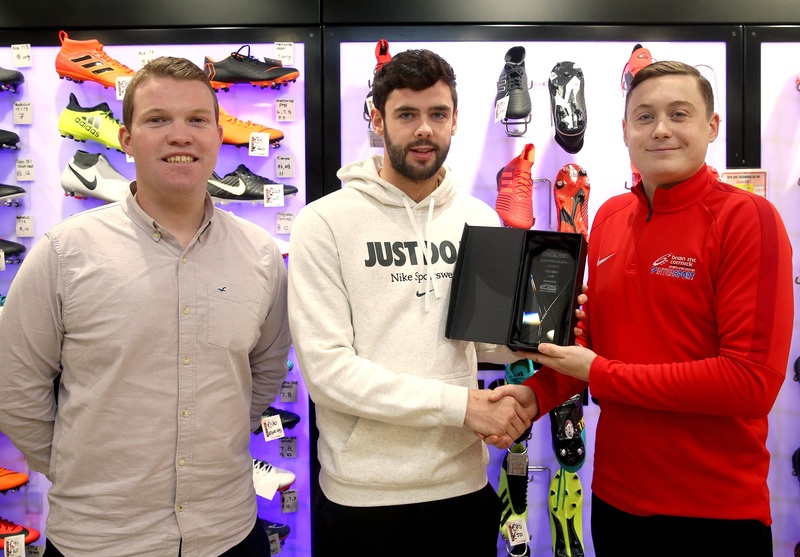 Odhran MacNiallais receives the Sports Personality of the Month award from Dan O'Donnell, Brian McCormick Sports, Letterkenny and Ryan Ferry, Donegal News. THE past few months will live long in the memories of the people of Gaoth Dobhair as their senior gaelic football team have enjoyed a wonderful run of form. Mervyn O’Donnell’s team got their hands on the Dr Maguire Cup for the first time in 12 years back in October, and now they are on the verge of Ulster glory after defeating Cargin and Crossmaglen Rangers. It has been some rise to prominence for a group of players who had flattered to deceive in previous years. 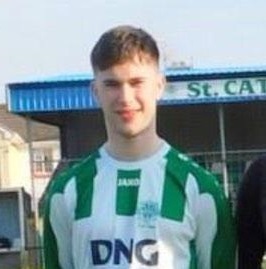 With some of the finest players to don the green and gold of Donegal in the last decade among their ranks, and with a litany of up-and-coming stars, the public expected Gaoth Dobhair to delivery, but they were always found wanting. The tide started to turn last year when they reached the county semi-final, but there was still more in them. O’Donnell’s charges came back strongly in 2018, and they defeated all around them to deservedly be crowned county champions for the first time since 2006. Odhrán Mac Nallais was the star performer in the final triumph over Naomh Conaill, and he was thrilled to accomplish a life-long ambition. 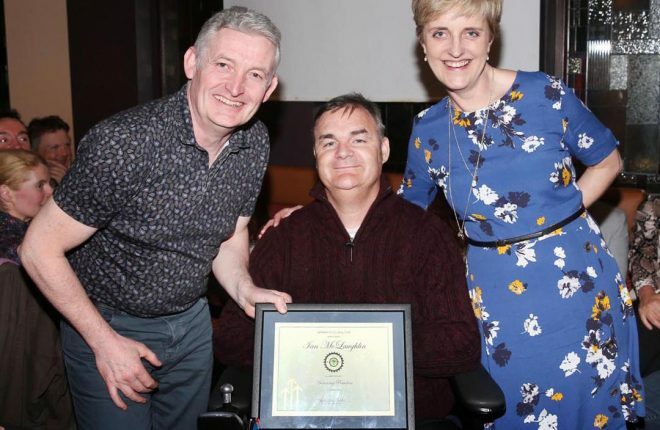 “We have been hearing it for a few years now that people have been tipping us and saying that we are favourites, but we never delivered,” said Mac Niallais this week as he collected the Donegal News Sports Personality of the Month award for October, in conjunction with Brian McCormick Sports. “People were right to question us because we had underachieved I suppose in the last few years. “It was nice to put that to bed this year and to finally win the county championship. 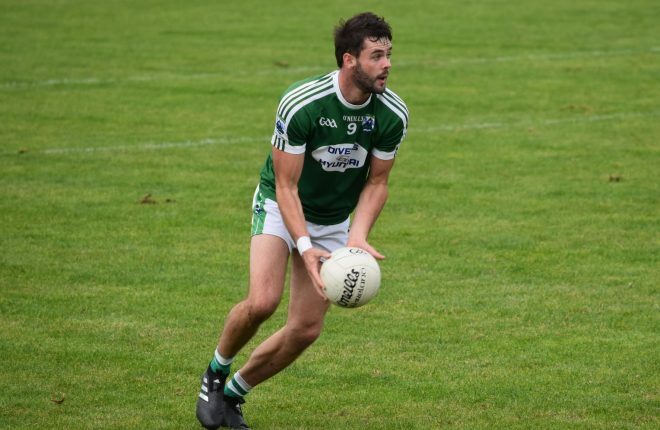 Mac Niallais scored four points as Gaoth Dobhair eased past Mac Cumhaill’s to reach the county final, and that led to a huge build-up of excitement in the local area. 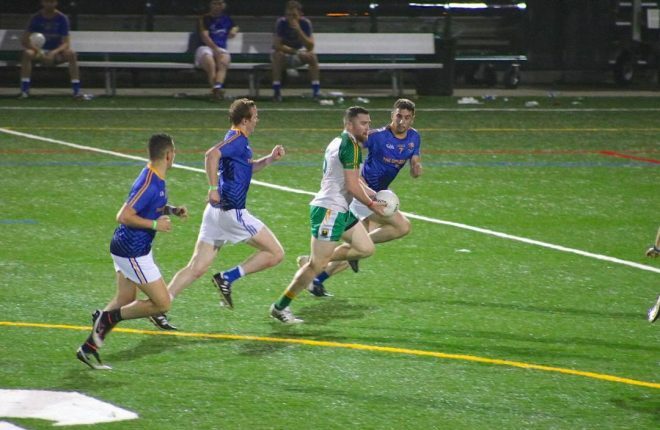 The Donegal star managed to keep his dead down and away from the hype and he and his teammates were ready for the decider against Naomh Conaill. A tight game was predicted but Gaoth Dobhair produced an excellent display and were comfortable winners. “It was 12 years since we were even in a final and people were getting very excited and there were flags up everywhere. “It’s great to see that, and it’s brilliant for the parish. Everyone loves going out to the games. “It was nice for us to give something back to those people that come out and support us all the time. “We had a lot of good performances during the championship and we were building all the time. “But we were still waiting for that one big performance and there was no better time to do it than in the final. Naomh Conaill held the upper hand in Gaoth Dobhair in their recent championship clashes, but the Maghergallon men had too much class for them on county final day and won on a scoreline of 0-17 to 1-7. Mac Niallais was Gaoth Dobhair’s chief marksman in the decider, and his elegant performance saw him pick up the Peadar McGeehin Man-of-the-Match award. “I think I got eight points so I was happy enough with that. “But for me it was all about getting that trophy because it has been a dream of mine to win it since I started playing football. The Gaoth Dobhair players weren’t long on the bus home after that triumph before social media was buzzing with their post-match celebrations. Former Derry GAA star Paddy Bradley tweeted that if he could have been anywhere in the world that night, it would have been in Gaoth Dobhair, and Mac Niallais and co certainly enjoyed the party. “To say it was lively would be an understatement. There were great celebrations. “In the years before this when we got knocked out, things were lively, so you can imagine what it was like when we actually won it. “It was just a brilliant couple of days and every man enjoyed it. “There were people in the pub on the Monday that you would never see in the pub. It’s traditional for county champions to enjoy the few days after their success, but sometimes players don’t know when to stop. 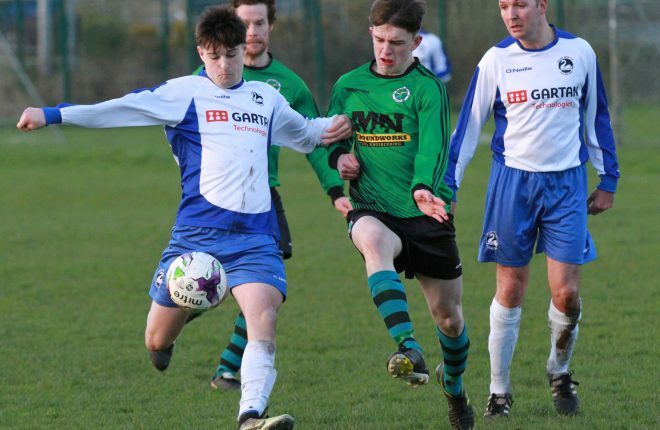 Castlerehan won the Cavan title this season after falling at the final hurdle in each of the previous three seasons. Their manager said it was nine days before he got his players dried out and ready for action again. However, Mac Niallais said there were no such issues in the Gaoth Dobhair camp. They made the most of their success in the county championship, but also set their eyes on giving the Ulster Club Championship a rattle. “You have to get back to is quickly. You only have two weeks and there is a bit of abuse to the system too particularly in the week after. 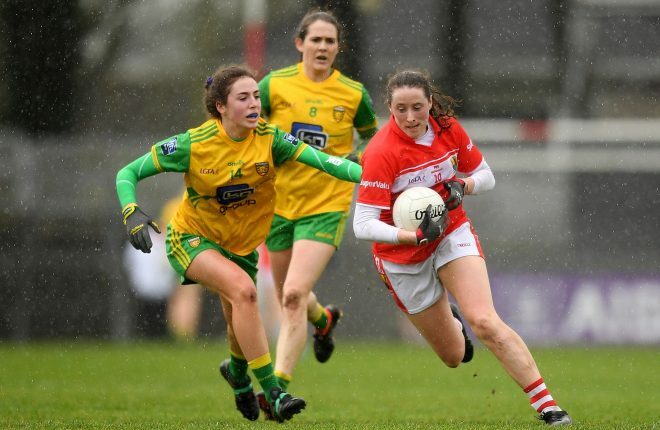 “We got back training on the Thursday and we forgot about the county final and got over it. “It was great to win it but there was another trophy to win as well, and that was every man’s aim up until the Cargin match. Gaoth Dobhair got the better of Cargin and then made a huge statement by defeating Crossmaglen last week. That has made the rest of the country sit up and take notice, and O’Donnell’s side are the bookies favourites to win the provincial title. 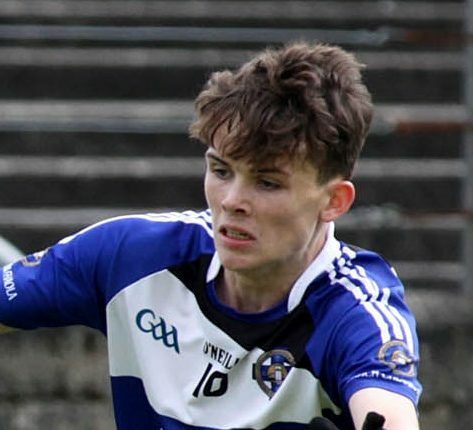 Mac Niallais isn’t so sure about that, and he believes they will have their hands full against Scotstown side that are laden with talented players and Monaghan stars. “Every team at this stage is going to have a crop of county players. “And they aren’t just any county players – they are up with the best in the country. “You have the two Hughes, Conor McCarthy, and Shane Carey, who are flying it and you can’t forget about Rory Beggan either. “They are a top team and we are going to have to do a lot of work on them in the next two weeks. “Scotstown have been there and they have won four or five county championships in recent years, and they reached the Ulster Final a couple of years ago. 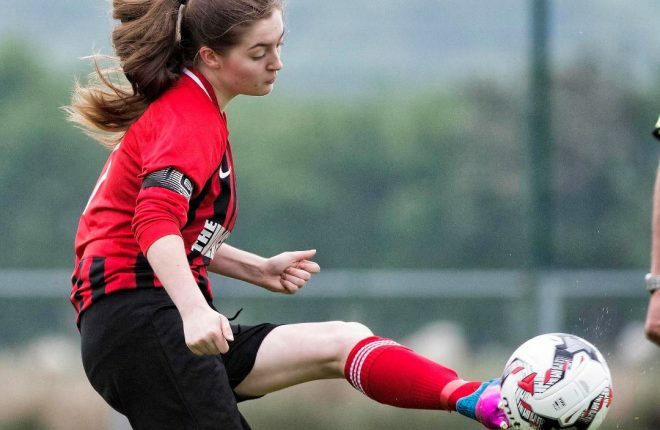 Amanda Callaghan gives us an insight into the Fanad United dressing room. Aidan Doohan gives us an insight into the Cloughaneely dressing room.